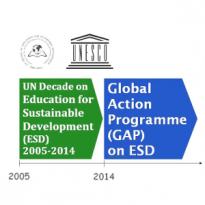 The Global Action Programme (GAP) on Education for Sustainable Development (ESD) seeks to generate and scale-up ESD action. It is intended to make a substantial contribution to the post-2015 agenda. The overall goal of the GAP is to generate and scale up action in all levels and areas of education and learning to accelerate progress towards sustainable development. After three waves of submissions this year, ESD stakeholders have made 360 launch commitments , including an initial one by the IAU, to support the GAP on ESD that was launched on the 12th of November. The IAU invites you to consider submitting a commitment! (See links below).